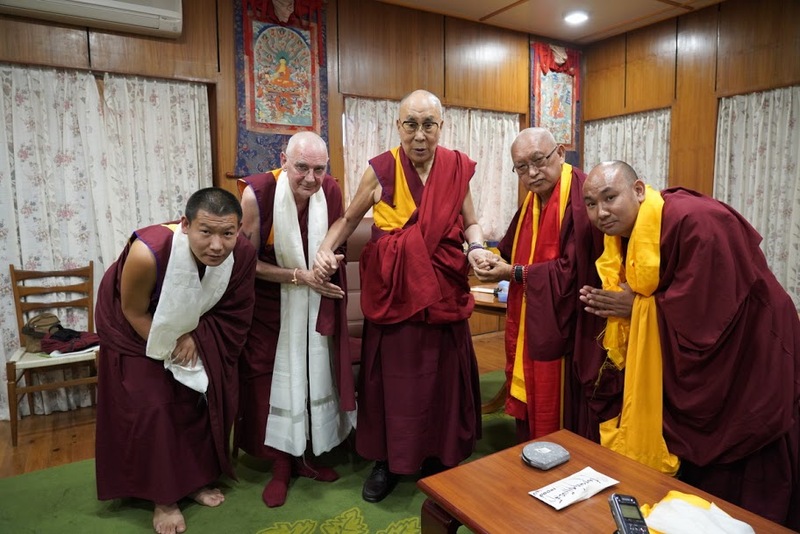 August 2018 – Lama Zopa Rinpoche meeting His Holiness the Dalai Lama in Dharamsala, with Ven.Roger Kunsang who did a comprehensive presentation of FPMT to HHDL, also with Ven.Tendar and Ven.Topgye – Namgyal Monastery, Dharamsala, India; Photographer: Office of His Holiness the Dalai Lama. His Holiness the Dalai Lama is in hospital, suffering from what seems to be an infection. Tenzin Osel Hita sent a message to Rinpoche, asking if prayers or pujas can be done by all the centers for His Holiness, with some suggested practices. Lama Zopa Rinpoche checked, and is now advising all centers, projects and services to please make tsog offerings: requesting for His Holiness’ long life, and to be free of the present illness. Also to purify our own degenerated vows and samaya, and to hook realizations. This Sunday, 14 April, at 1.30pm we will be offer Guru Puja with Tsog Offerings. We will be making strong prayers requesting for His Holiness’ long life, and to be free of the present illness. Also to purify our own degenerated vows and samaya, and to hook realizations. If you would like to sponsor this Guru Puja with Tsog Offerings click here. We are collecting donations for the FPMT Animal Liberation Sanctuary in Nepal. The Animal Liberation Sanctuary is managed on a day-to-day basis by Kopan Monastery and is under the direct care of Enlightenment for Animals, a project of the FPMT. Currently there are eight cows, two sheep, and 50 goats. Most of the animals at the Sanctuary have been rescued by Lama Zopa Rinpoche. The Animal Liberation Sanctuary provides shelter and care for animals rescued from being killed, so that they may live out their natural lives in peace and attain a higher rebirth. The Sanctuary benefits rescued animals not only by freeing from impending death, but also by exposing them to the Buddha Dharma. They regularly hear mantras and are led around holy objects. This way they create merit and gain the opportunity to escape the lower realms. They are cared for by a manager and a veterinary assistant, with an experienced vet on call when needed. The late Khensur Rinpoche Lama Lhundrup explained that the merit of supporting liberated animals is the same as liberating an animal yourself, for without ongoing care and shelter the animals would not survive. If you do support this please dedicate for His Holiness the Dalai Lama’s long life and excellent health. To read more about the work of the FPMT Animal Liberation Sanctuary click here. If anyone would like to contribute ANY amount to DCI’s collective donation for the FPMT Animal Liberation Sanctuary to help them continue their work, we welcome you to click the button below.